The Russia Investigations: So Many Pieces Of The Puzzle Are Missing Two years after important overtures by foreign operatives to the Trump campaign, Russian motives still aren't entirely clear. 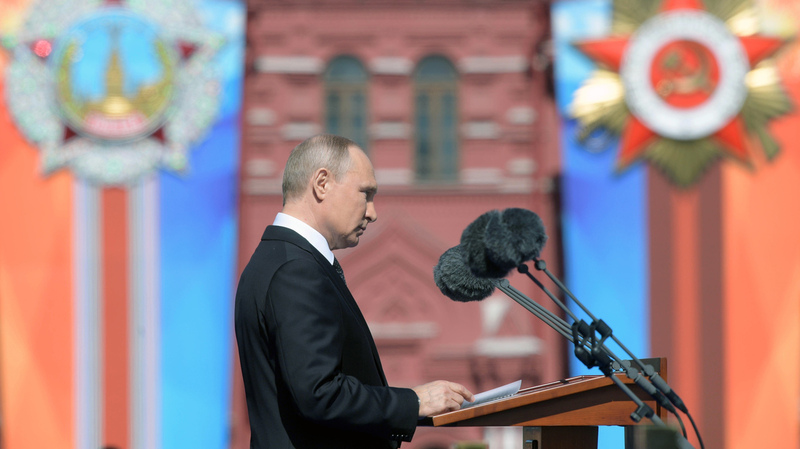 Russian President Vladimir Putin gives a speech last month during a military parade at Red Square in Moscow. The Russia imbroglio is a tale told out of order about a puzzle with pieces missing. Without knowing what goes in the blank spaces, it's impossible to know what to make of the whole thing. The broadest outline has become clear: Russian President Vladimir Putin sought vengeance against the United States and the West after what he perceived as an outrageous overstep by Washington, D.C., into his own front yard in 2014 after Russia's invasion of Ukraine. Putin ordered a historic spike in Russia's decades-old "active measures," a broad wave of both overt and clandestine actions aimed at sowing chaos, undercutting public confidence and, eventually, hurting or helping specific political actors. That strategy persists to this day, U.S. intelligence officials warn, and they say they expect it to last through the 2018 and 2020 elections. Even if Americans are more on guard about future foreign interference, big questions still remain about the Russian effort that took place during the 2016 cycle. Did the Russians really have Hillary Clinton's emails? Intelligence operatives who reached out to Donald Trump's campaign aides in the spring of 2016 said they could provide "thousands" of emails about Hillary Clinton, according to court documents. The materials don't specify whether they were the emails deleted from the private server that Clinton used while she was secretary of state. The Russians also promised more generally that they had "dirt" on Clinton that could help Trump's campaign. These promises got the attention of Trump aides from the most junior to the most senior level and led to a number of known contacts. At least one Republican operative sought outside technical expertise to try to verify data he was being promised, an effort that apparently went nowhere. More than two years after those initial offers, however, Clinton's emails have not become public — although many other messages did, to the embarrassment of Democratic National Committee political operatives and others. So did the Russians ever really have Clinton's emails or was it a ruse? Or had the offer from Moscow become garbled and were the Russians actually touting the DNC emails they really did have? The answer to this question is important because it's the difference between Russian intelligence officers just toying with the Americans and their potentially giving advance notice about their plans for later in the year. Intelligence officials and court documents suggest that the Russian government's objectives in its 2016 interference effort evolved over time. Putin and his supporters loathed Clinton for a variety of reasons, including her criticism of Russia's suspicious elections and fear of tough new policies toward Russia if she were elected president. So their case against her is clear. Some evidence suggests the Russians initially wanted to get behind only the most "extreme" candidates to maximize the noise inside the U.S. In February 2016, according to court documents, orders went down to the St. Petersburg influence-mongers at the "Internet Research Agency" who were waging a social media campaign to amplify controversy. Their instructions, as prosecutors later revealed, were to "use any opportunity to criticize Hillary and the rest (except [Vermont Sen. Bernie] Sanders and Trump — we support them.)" But by March 2016, Russian intelligence operatives in London were reaching out specifically to Trump campaign foreign policy adviser George Papadopoulos, according to court documents, to offer the emails, "dirt" and "off-the-record" meetings between campaign leaders and Russian officials. By June, exactly two years ago on Saturday, a Russian delegation visited Trump Tower to provide Donald Trump Jr. and other top campaign leaders with a political tip, according to the accounts of people in the meeting, that billionaire Democratic fundraisers might be moving money out of Russia and into the Democratic National Committee. That wasn't the "dirt" on Clinton that the Russians had been promising, and so Trump Jr. said he and the campaign took no action. Even after all this time, that answer still isn't clear. Or was there more discussed than the people involved have acknowledged? Was the New York City meeting only a test to see whether Trump Jr. would call the FBI — and when he didn't, did more substantive communication follow? Trump, Trump Jr. and the rest of the leaders of the campaign say there was no conspiracy with the Russians who were attacking the election. The House intelligence committee's Republican majority has said there was no wrongdoing and, at worst, these and other contacts between the campaign and Russians in 2016 were "ill-advised." One of the campaign leaders in the Trump Tower meeting, Trump's son-in-law, Jared Kushner, has had his top-secret security clearance restored after a suspension earlier this year. The move was interpreted as a good sign for Kushner if it indicated that counterintelligence officials didn't raise any red flags about him. Given that there appears to be no recording or independent account of the Trump Tower meeting, any evidence about the Russians' intentions or their perspective on its outcome might be a foreign intelligence question. Will the CIA or National Security Agency answer it? How much "infiltration" was there of American political organizations? Why did the Russian government spend so much time building its relationship with the National Rifle Association? One apparent reason was to use it as an intermediary through which to make connections to Republican political figures, including the Trump family — although it isn't clear to what end. How else did the Russian government perhaps want to use the NRA in the 2016 cycle? The gun-rights group has denied any wrongdoing and declared to Congress that the donations it has raised from Russians or people in Russia amount to barely a pittance compared with the total it brings in. So is the case closed on political infiltration or is there more to discover? One question is about whether the Russian government may have funneled money into U.S. political groups or campaigns in order to secure influence. Russians may literally have flown cash into the United States to give to intermediaries to contribute — without disclosing its origins. Glenn Simpson — founder of the private intelligence firm Fusion GPS, which commissioned the infamous Steele dossier about Trump and Russia — told the House intelligence committee that Russian operatives may have infiltrated other political organizations. Some of them included the California and Texas statehood independence movements, he said. What don't we know that we don't know? There are details about the active measures we know we know. There are aspects, as discussed here, we know we don't know. But what, as former Defense Secretary Donald Rumsfeld might have asked, do we not know that we don't know?